I get snacky at night. After everyone else in the house is asleep and I have control of the remote, my mind turns to the refrigerator. I am smart enough not to keep things like ice cream or candy bars in the house, but that doesn’t mean there aren’t other bad snack choices around for me to make. Last year, I finally jumped on the Greek yogurt bandwagon, and I have been riding it ever since. I know that there are people who know the benefits of Greek yogurt but won’t eat it because of its distinctive tangy flavor. I am here to tell that it’s just because they haven’t added the right mix-ins yet. I keep these seven ingredients in the house at all times so that I can toss them in a bowl with some Greek yogurt before settling down in front of the laptop or DVR. 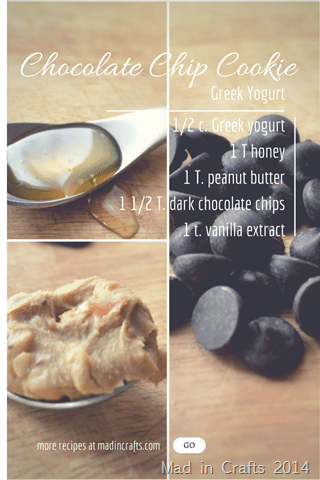 With these seven ingredients, you can make almost endless combinations of delicious Greek yogurt treats. 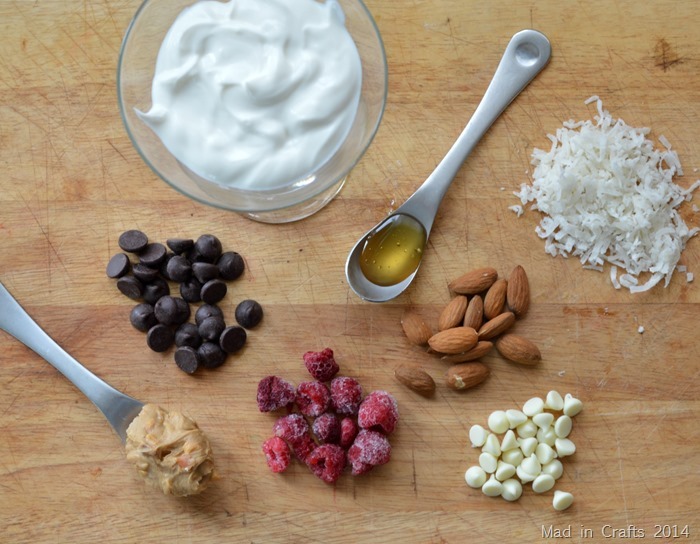 All of the ingredients can be kept on hand so that you can grab what you need when you feel the urge for a yogurt snack. 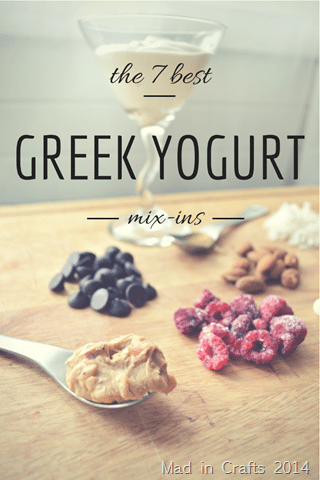 Before I show you how to combine these mix-ins to make some of my favorite Greek yogurt recipes, I want to make a few things clear. When I researched the nutritional information for each of these recipes, I plugged in the ingredients that I normally use (aka the cheap store-brand stuff). If you buy organic, gourmet, or other high-class ingredients, you should calculate the nutritional info on your own. Also, it’s important to note that while I use these recipes as healthier alternatives to other snack foods, they aren’t DIET foods. If you are watching your calories closely, they might not be for you. I love using Greek yogurt as a snack because the pumped up protein keeps me feeling full longer than other snack foods, not because it’s particularly low-calorie. That being sad, even small changes make a positive difference when it comes to watching what you eat. Coconut and dark chocolate is one of my all-time favorite flavor combinations. 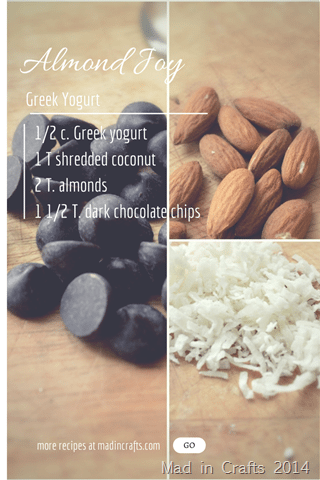 By mixing these ingredients into your yogurt, you can get a fairly accurate replication of an Almond Joy candy bar. This version just has some actual health benefits. There is nothing that competes with a home baked chocolate chip cookie still warm from the oven. Nothing. Unfortunately, after you bake cookies and eat two of them, you have the rest of the batch staring at you for the rest of the night. If you can resist a whole batch of fresh chocolate chip cookies, you are a stronger person than I. 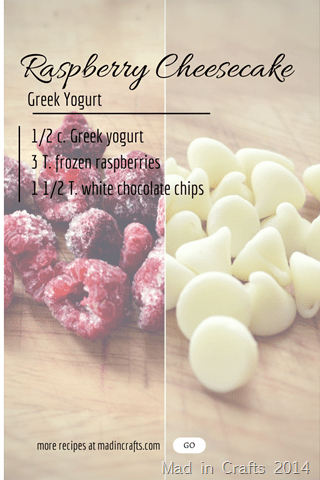 Get the same flavors in this single serve portion of yogurt. 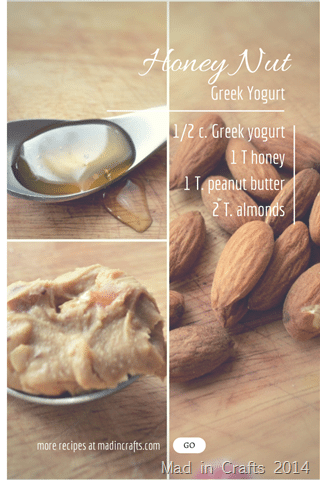 If you love salty sweet desserts, this Greek yogurt recipe is a life saver. It will satisfy that salt/sugar craving and give you added protein to help you feel full longer. There is a secret to making this yogurt recipe especially delicious. When you mix up the ingredients, let the yogurt sit for two minutes before stirring again. This will give the raspberries time to melt slightly into the yogurt. Instead of plain yogurt with bursts of frozen berries, now you have tart raspberry flavored yogurt with delicious white chocolate surprises. It makes a world of difference. These are just some of the yogurt combinations that I mix up at night when I am working on the blog while everyone else is sleeping. I am sure it would be healthier still for me to gnaw on a carob pod or something but that’s just not realistic. Baby steps, right? What are your favorite Greek yogurt mix-ins? Did I miss any good ones? Did you like this post? Think it’s worth sharing? Please share with your friends using the social media share buttons at the bottom of the page! Sorry you had that trouble! You just used one teaspoon? I used only a 1/4 teaspoon and it was good, I’ve seen recipes that say 1 teaspoon but I’ve also seen them say 1/4 teaspoon, I’d stick with 1/4. What kind of peanut butter are you using? It looks really good! Just good old Extra Chunky JIF! I use half a cup of special k touch of honey granola and chop up about 3 strawberries. That sounds fantastic! I love Special K cereals. I have them for \”dessert\” all the time. Thanks for the comment! These are awesome suggestions, esp the Almond Joy. Woo-hoo! Thanks so much! I’ve been buying Chobani with fruit on the bottom and adding flax seeds (I know, YAWN) which is why I searched this out lol.